It all starts with a simple question: How do I add a popup on WordPress? Yet, this simple question has vast implications. 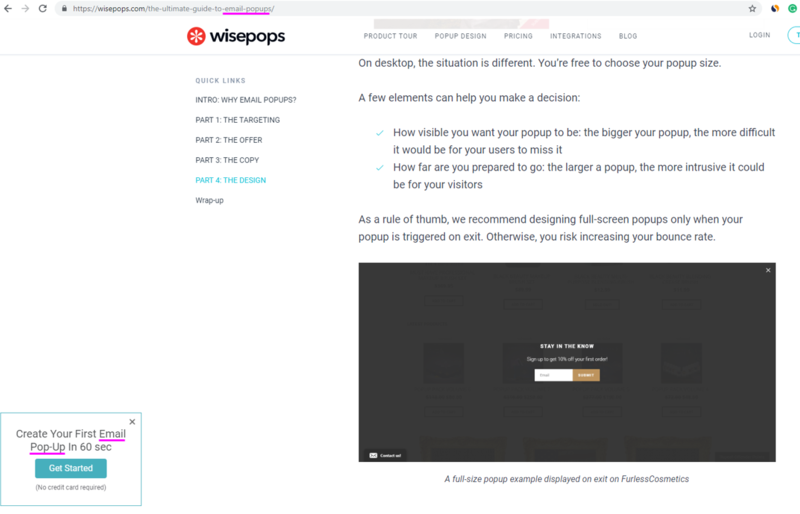 In this article, we’ll explain the different kinds of popups you can create for your WordPress site, how you can create the best WordPress popup ever, and how to choose the best popup plugin. Let’s not waste any more time: Here we go! Before uncovering the secrets of the best WordPress popups, it’s worth detailing all the different kinds of popups available and what they’re best used for. Lightbox popups or lightbox modals are probably the most popular kind of popups. The popup is displayed on top of an overlay. The overlay darkens the page and highlights the popup so that the user can focus on its message. Let’s not beat around the bush here: lightbox popups are very intrusive. They literally interrupt whatever your user was doing on your website. So they’re usually displayed on exit (see next section to understand what this means) to catch the user’s attention at the last minute. We recommend that you not display them as soon as your user lands on your website, as you could put her off. Exit popups, sometimes called exit-intent popups, are triggered when the user’s mouse reaches the top of the screen to close the current tab or window. Until recently, they were available only on desktops. But it’s now possible to create mobile exit popups based on a different algorithm (user scrolls up or presses the back button). Exit popups are great for catching your users before they leave with an attractive offer or to ask for feedback. Yes, mobile popups are different from their desktop counterparts. Mostly for SEO reasons. But also for UX reasons: the user experience is very different when you’re using your fingers instead of a mouse. 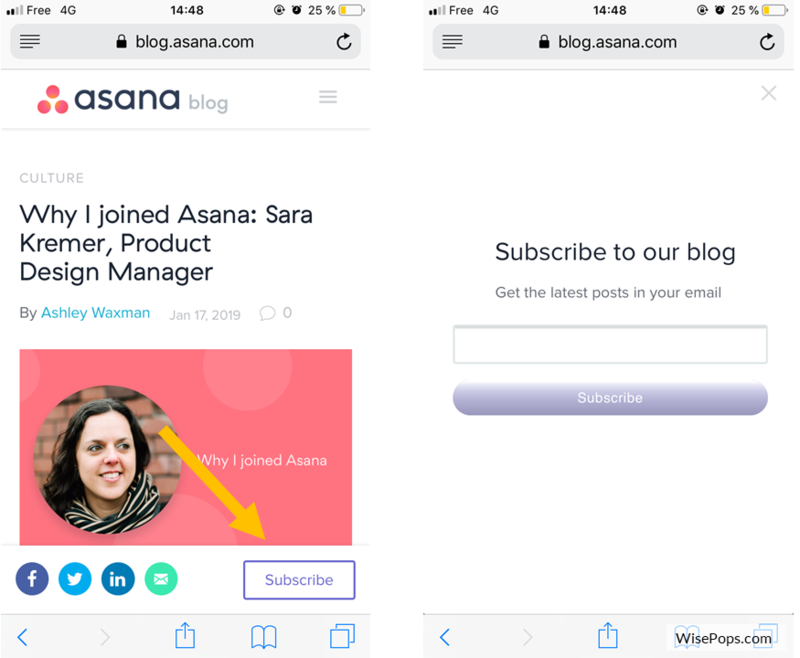 To adapt to these two constraints, mobile popups are usually smaller – for SEO reasons – and require a focus on usability (how hard is it to close it? to interact with it?) for UX reasons. Here’s an illustration on Asana’s blog. They display a thin bar featuring a “Subscribe” call-to-action that triggers a full-size popup on click. The call-to-action is subtle, yet very easy to click. When it comes to the popup itself, it’s very easy to leave your email, yet at the same time, easy to close if you change your mind. Slide-in popups appear from one of the screens’ sides when the user scrolls down the page. Here’s a demo on thisiscolossal.com. 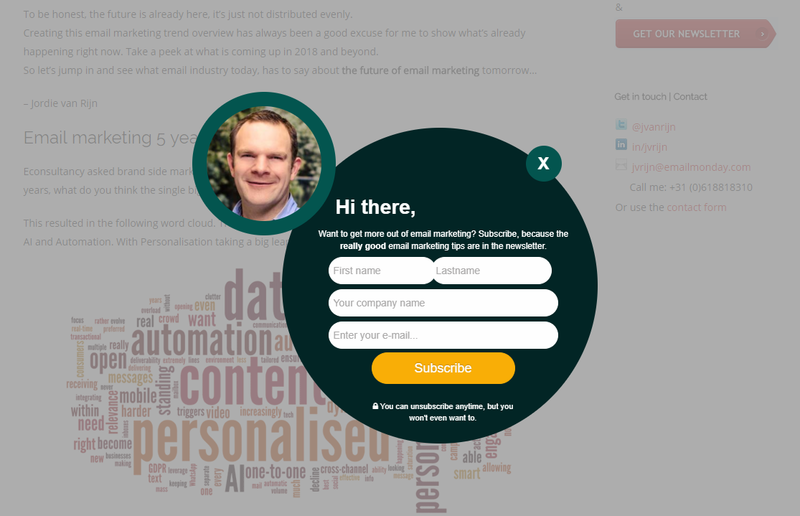 This kind of pop-up is usually found on blog posts, as it allows marketers to promote their newsletter without interrupting the visitor while he’s reading the article. If you want to see more examples of WordPress popups, I recommend this article. Now that we’ve covered the different formats, let’s discuss the best practices. You’re probably already aware that popups frustrate a lot of Internet users. One of the main reasons a lot of users get pissed off about popups is that they keep showing up again and again. 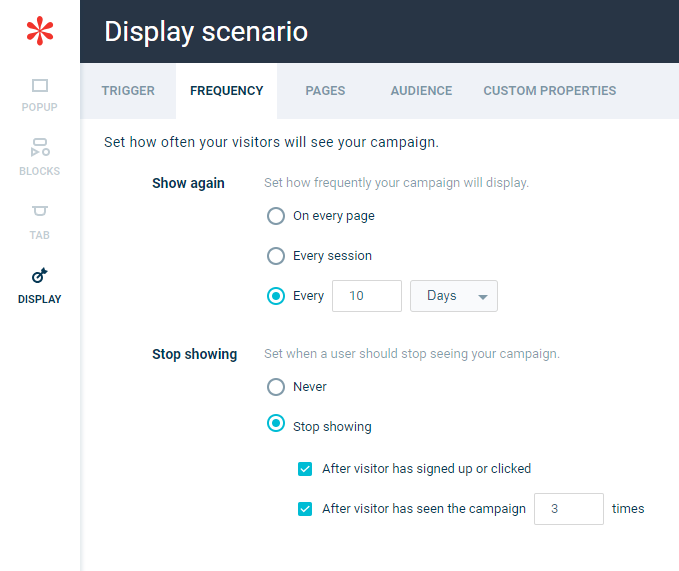 So do your visitors a favor and set your popup to appear only once in a while, and set a maximum number of displays for your campaigns so that your loyal users don’t have to keep seeing your popups all the time. It goes without saying (although not all plugins include this option) that you should also exclude the users who have already joined your email list or accessed your website from your newsletter. If you have enough traffic, segment your campaigns. Having multiple campaigns will allow you to tailor your message to your audience and increase your conversion rate. Here’s an example on our own blog where the popup’s copy matches the content of the page the user is currently browsing. If you’re creating an email signup popup, make sure to add an incentive to your popups. AB tests run by our clients show that they have a major impact on the conversion rate of opt-in modals. Take the example of this online retailer. When they add an incentive to their popup (in this case, a chance to win a free pair of shoes), their subscription rate can reach up to 20%. When they don’t, their conversion rate peaks at 2%. This doesn’t apply only to e-commerce. If you’re running a blog or have a B2B business, you need to think about something that you can offer to convince your potential subscribers to add their email to your marketing list. It can be a free ebook, a PDF transcript of the article they’re reading, a free sample, etc. If you don’t offer anything, make sure to point out what makes your newsletter worthwhile and why they should subscribe immediately. Visuals can reinforce your message and help your visitors visualize the benefits they’ll get from receiving your newsletter. Unfortunately, when it comes to popups, there’s no one-size-fits-all strategy. That’s why we recommend you experiment with your modals. Trigger and timing test: try displaying your popup on landing vs. a few seconds later, on landing vs. on the second page, on landing vs. on exit, etc. Try different incentives: no incentive vs. an ebook, no incentive vs. free sample, etc. Test your wording: from your headline to your call-to-action, make sure to optimize every word that you include in your modal. Try different positions (in a test on our blog, we were able to increase our click-through-rate by 60% by switching from a popup displayed on the right side to a popup displayed on the left side). Now that we’ve discussed the theory, let’s discuss the practice. What plugin should you use to build your popups? Well, as someone working for a popup solution myself, it might be unfair to suggest names. But I’ll be happy to detail the elements that are worth checking when you choose a popup builder. Of course, finding a free plugin is always nicer than to have to pay for a plugin. Plus, the WordPress ecosystem was built on open source and free solutions. But, when it comes to WordPress plugins, it’s a different story. Plugins can introduce vulnerabilities, slow down your website or even crash it. So before picking a plugin because it’s free, make sure it looks legit and that it’s really free (there are a lot of Freemium plugins that pretend to be free). One-time payment: Some solutions allow you to pay a fixed fee to download and use the plugin forever. One example is Ninja Popups (they charge a one-time fee that must be renewed to benefit from their support). Subscription-based: These solutions require a monthly payment to use their popup solution. This is the case for WisePops and Popup Maker, for example. Be careful- not all of these solutions use the same pricing models. For some, you pay the same price whatever your traffic. For others, you’ll pay a different amount depending on the number of popups displayed, page views or sessions. Some solutions also charge an extra fee to unlock premium features. I recommend you prepare a mockup of the popup you’d like to design before trying any solution. And only then – after you have a design in mind – test the solutions. This will allow you to get a realistic idea of whether the solution can work for you or not. Targeting is usually the weakest area of WordPress popup plugins. What triggers does it include by default? Can you create exit popups? Trigger messages when users scroll down? How easy is it to create an audience? Does it allow you to select visitors coming from a specific source of traffic? Can you differentiate new and returning visitors? 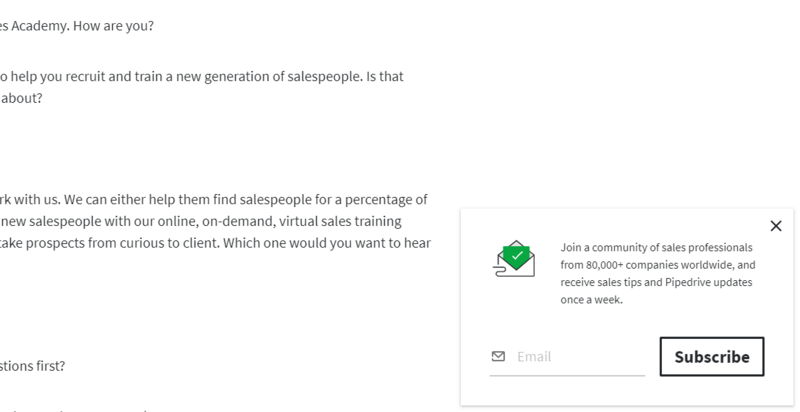 How far can you go in terms of segmentation? Can you limit your popups to URLs containing specific keywords? 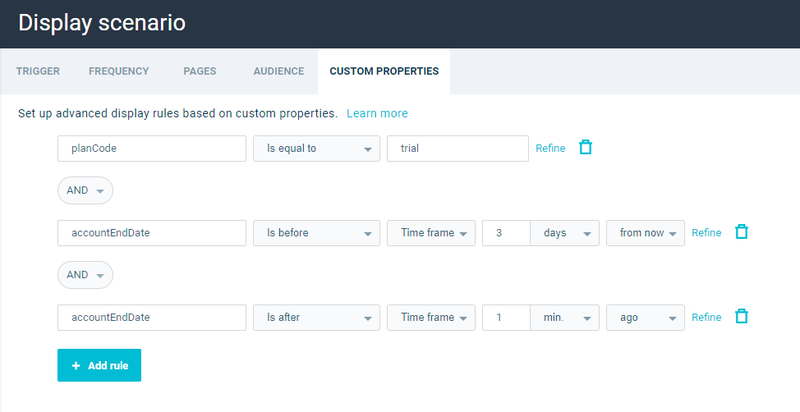 Can you create your own segments (for example, logged in users)? Responsiveness: can you separate your mobile and desktop campaigns? How do the popups behave on large screens? Smaller screens? A screenshot of one of our campaigns’ targeting scenario. The popup is configured to appear only for users who are getting close to the end of their free trial. And last but not least, does it integrate with your Email Service Provider? If so, how far does it integrate? For example, if you’re using MailChimp, can you select the destination list for your new subscribers in your MailChimp popup? Can you trigger a welcome email? Can you collect hidden details to enrich the contact? Sometimes, simple matters such as adding a popup to your website prove more difficult than expected. I hope this article will help you build the best WordPress popup faster! If you have any questions, feel free to share them in the comments.